In its newly beefed state Movement Festival is more than enough festival for most dance music fans. Yet the fun doesn’t stop after Hart Plaza empties out each night as Detroit blooms with dozens of afterparties that can satisfy almost any clubbing appetite. With so many events to choose from LWE decided to help fest-goers narrow down their options with our annual afterparty guide. We’ve also designated LWE’s picks — the parties that stand out the most and where you’ll most likely find us each night. @ Old Miami (3930 Cass) $10/7am-? TOTALLY WIRED – A FILM ABOUT SCHNEIDERS BÜRO, feat. Villalobos. 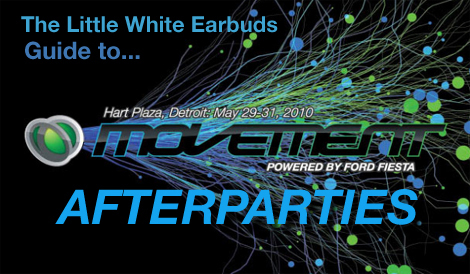 And these are just the afterparties?! Crazy lineups! You managed to pick the party I’ll be at with the exception of DJ Harvey on Monday. That just might be my highlight of my weekend. And yes, Dennis. These are just the after parties. SAT-Ostgut blitz at Centre St. TIP. Visionquest is playing at Old Miami on Mon, This is known, but they are now also playing Sunday morn/day at the SHXT show…Thus possibly freeing up a slot for the DJ Harvey show. ‘Eh?